26th Sept: Science Uncovered at the Tring Natural History Museum. • Sunday 31st August 2014. David Hutchinson - After seeing the juv Black Tern at Startops moved on to Wilstone where Steve Rodwell spotted a Great White Egret fly in. 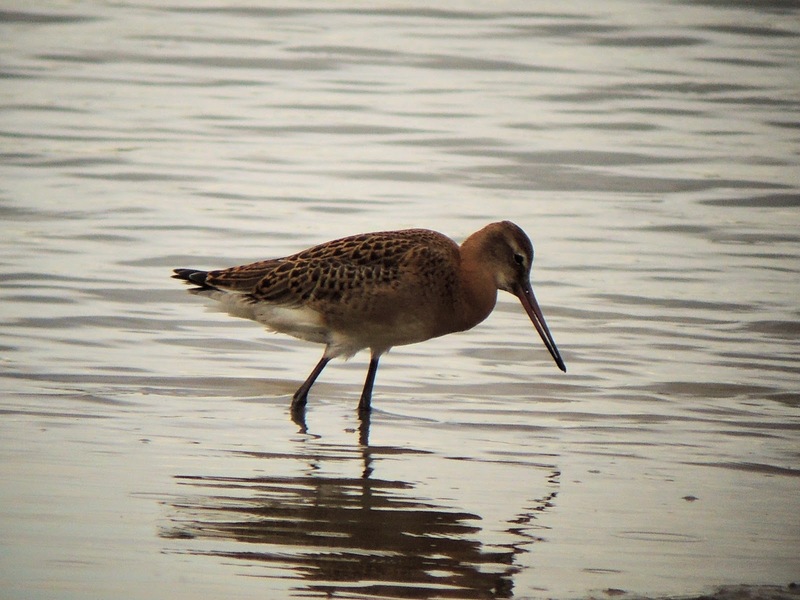 Also noted at Wilstone were 9 Black-Tailed Godwits, 2 Green Sandpipers, 2 Greenshanks, 2 Whooper Swan and 3 Shelducks. Hobby at College. 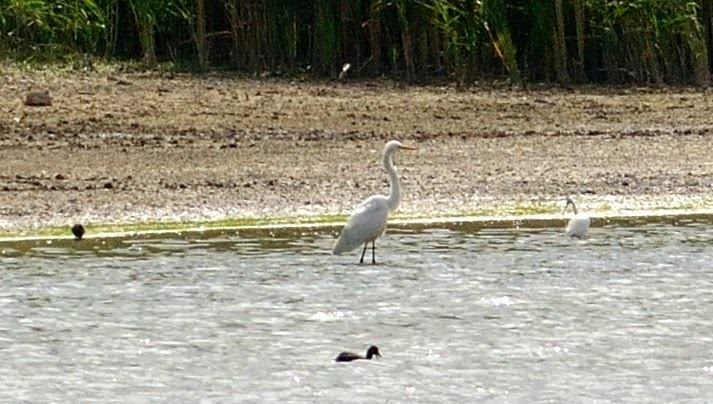 Dave Bilcock has just texted to say Steve Rodwell has just seen a Great white Egret arrive at Wilstone. 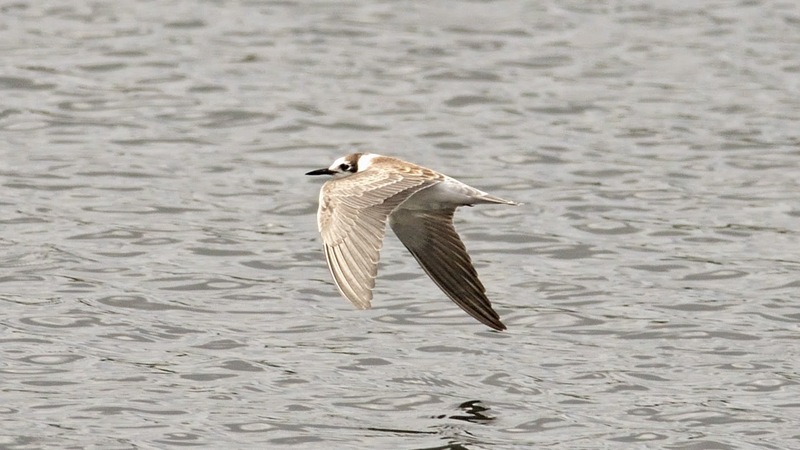 David Hutchinson has reported a Black Tern at Startopsend Reservoir. • Saturday 30th August 2014. Ben Miller - Bar-tailed Godwit reported by the new overflow at Wilstone per found my Mike C, per DB. • Wednesday 27th August 2014. Phill Luckhurst - Today was superb for birds of prey at Wilstone. Starting with 2 Hobby, 2 Kestrel, 2 Buzzard and a Red Kite. We also had visits from 2 different Peregrine though I didn't see the second bigger bird, only the scraggly one that seems to have been showing for a while. 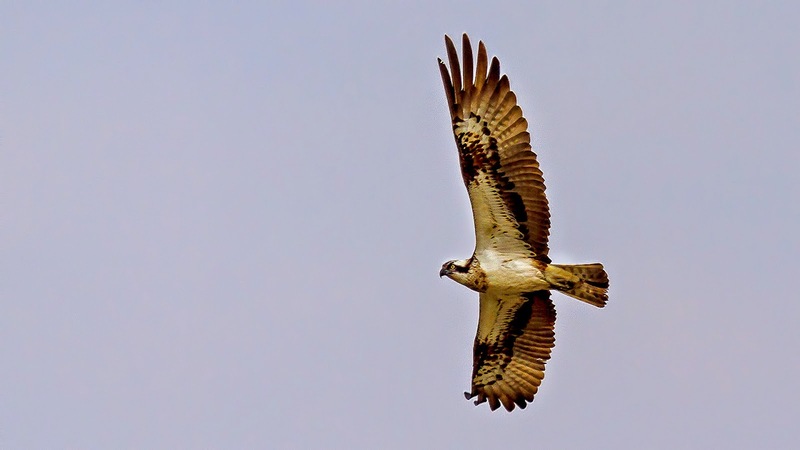 The jewel in the crown was the Osprey as others had reported. I had popped over to Startops to try and find the trio of Sandwich Terns someone else mentioned and when I got back to Wilstone I was told by Mike it had recently left. When I arrived at the hid it had returned and was being mobbed by various gulls. It landed a few times on various posts, in the shallows and on the bank before flying quite close to the hide where I grabbed these shots. Later it vanished over the poplars to the right. The res was buzzing with many smiling faces. 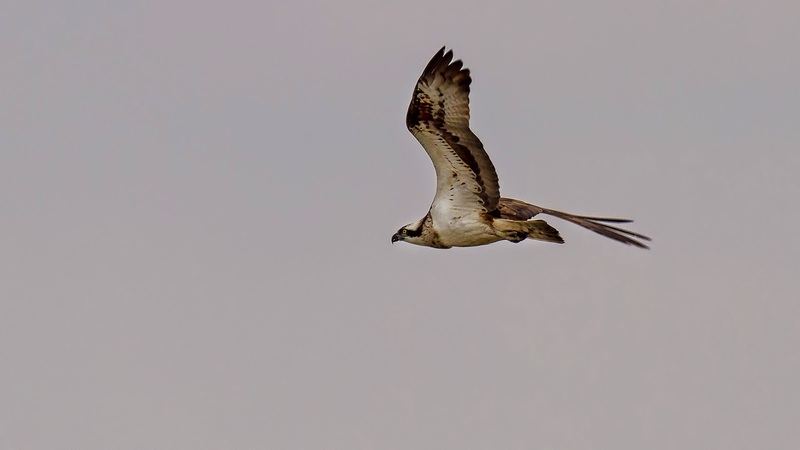 Doug Helsby - Fantastic views of two Ospreys causing amok amongst the Lapwings which took to the sky en masse. A juvenile Peregrine followed through. A Sandwich Tern was photographed but I didn't see it as concentrating on Ospreys. catching a fish in Wilstone, so no doubt there are better pictures out there. 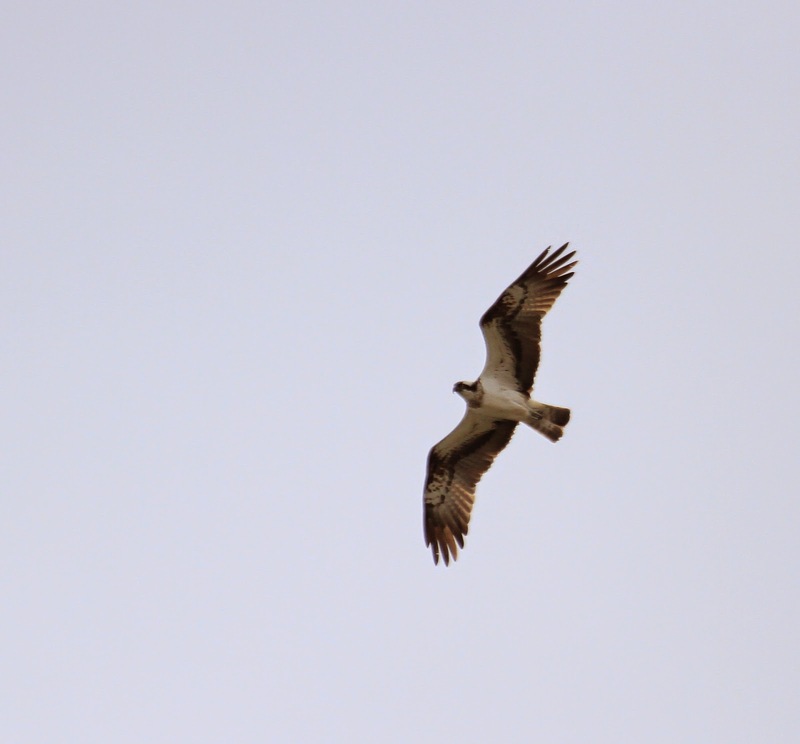 Heard that others said two Ospreys. Roy Hargreaves - The clear conditions suggested a chance of movement this morning and that proved to be the case. From Cemetery Corner ten Black-tailed Godwits, a Green Sandpiper and three Shelduck were the highlights. Between the new and old overflow a juvenile Little Ringed Plover was new in and a Common Redshank was visible close to the hide. From the hide a single Black-tailed Godwit, two Greenshank and several Common Sandpipers were visible and only two or three Little Egrets. While sat in the hide we heard Ringed Plover calls and a flock of nine bird eventually landed on the mud by the overflow and proved to comprise seven Ringed Plover and two Dunlin. The hedge through the hide meadow had a nice array of warblers with Garden and Willow being the highlight. The back fields had large flocks of Canada Geese in them, which is unusual in my experience as I think that the last flock of geese that I saw in these fields was fourteen Tundra Bean Geese in 2006 and in between them the lone Brent Goose that overwintered. • Sunday 24th August 2014. Roy Hargreaves - I delayed going out until late morning when the rain eased off. At Wilstone I headed for Cemetery Corner and scanned from there as it was reasonably sheltered. Three juvenile Shelduck were in that corner and eight Black-tailed Godwits, three Greenshank and a Green Sandpiper were scattered along the mud or in the water in front of the reeds. I checked the Little Egret nest on the way to the hide and there are still Egrets in it, but how many was impossible to say without waiting for movement. From the hide twelve Black-tailed Godwits were on the mud to the left along with a Greenshank and a Dunlin. The Greenshank and some or all of the Godwits had moved from by Cemetery Corner. Also more Green Sandpipers and Common Sandpipers were scattered around. Also among the hirundines at least one Swift was about. Marsworth had the usual Mandarin and Startops had a Yellow Wagtail. 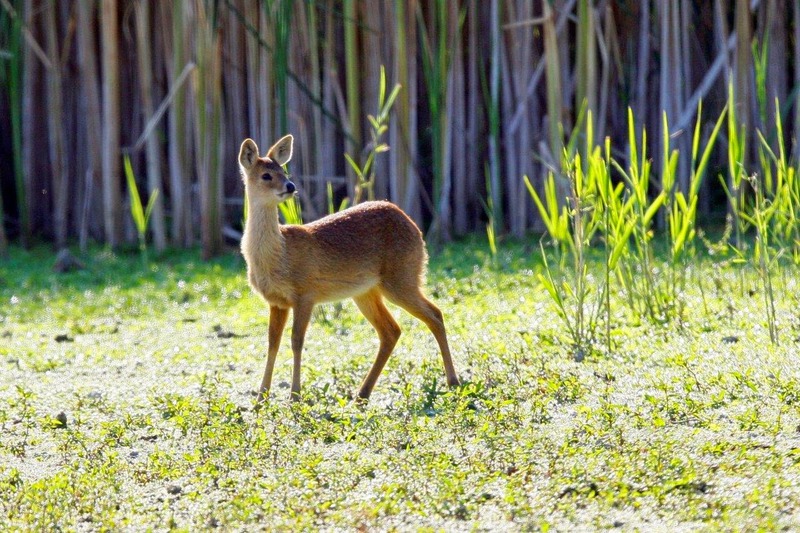 On the mammal front a Chinese Water Deer fawn ran across the overflow meadow and one came out onto the mud from the reeds to the right of the hide. • Saturday 23rd August 2014. James Heron - A couple of pics from Wilstone. Roy Hargreaves - This morning was crisp again but very pleasant and a day when birds were on the move. 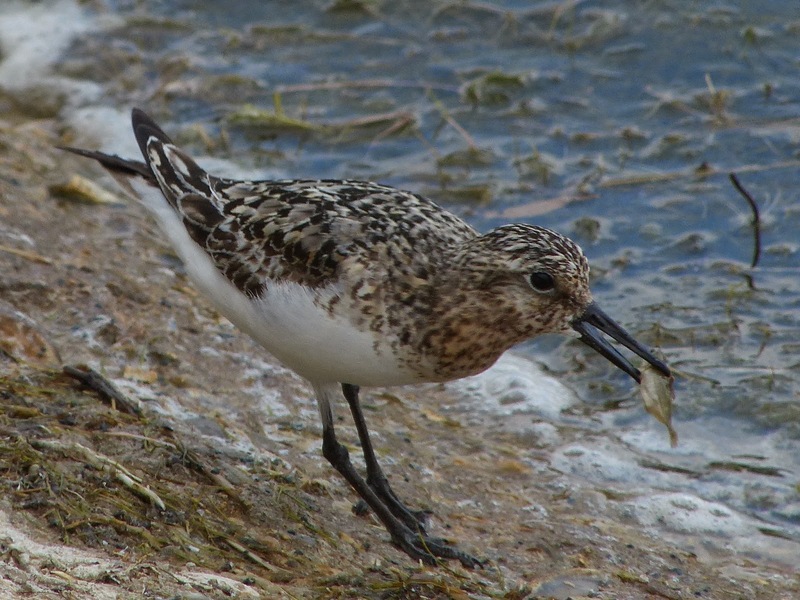 However, most of the waders appeared to have stuck around. 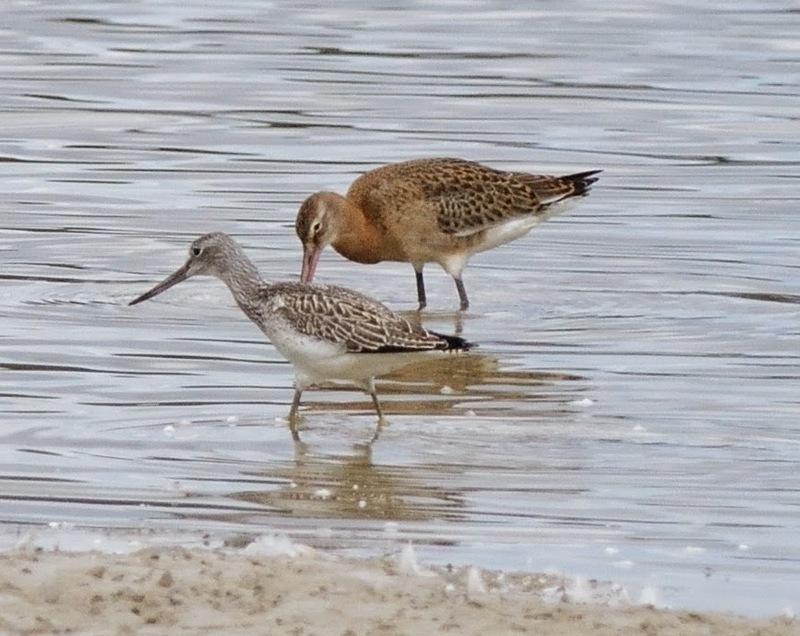 The thirteen Black-tailed Godwits, Greenshank, 3 Green Sandpipers and six Common Sandpipers seemed rather familiar. 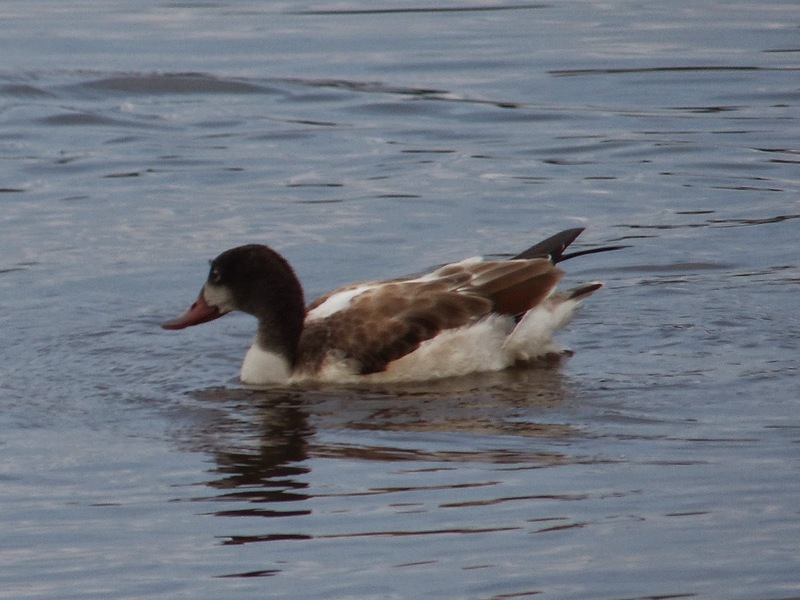 The juvenile Shelduck were up to three. A Yellow Wagtail was mobile along the edge between the north corner and car park. Sedge Warbler and Reed Warbler were in the vegetation in front of the hide. 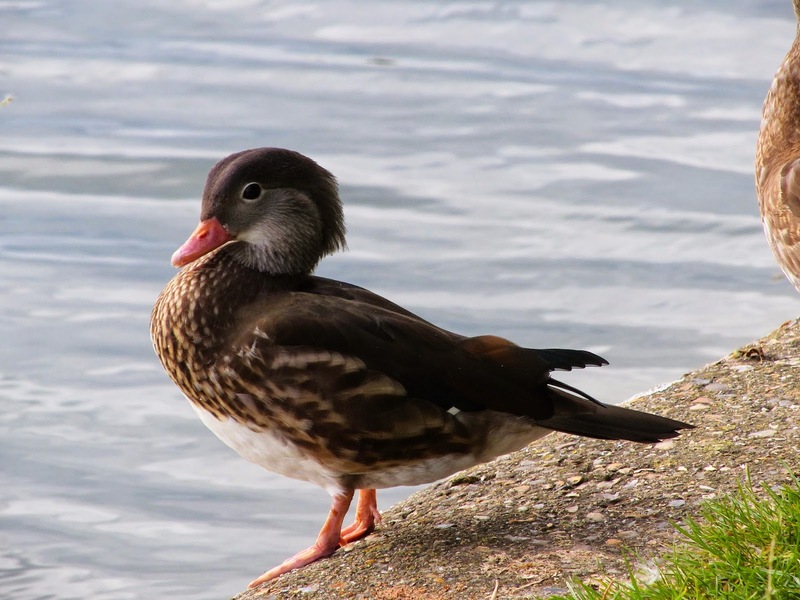 Tringford had three Red-crested Pochards on it, Marsworth had its usual Mandarin and a few Swifts with the hirundines. The paddocks and Startops had several mobile Yellow Wagtails moving from one to the other. • Friday 22nd August 2014. Phill Luckhust - After spending a while following cows around to try and photograph the Juvenile Starlings and Wagtails that seem to follow them around I popped down to Wilstone for last knockings of the light. From the old "Duck Feeding" area I had a wonderful surprise. Sally Douglas - Friday 22 August 2014 - 9.30-12.30. Had a very enjoyable walk round Wilstone with Richard Tomlin's U3A + Amersham Bird Club. All the recently observed waders were still present - 2 Dunlin on centre spit only viewable from the Jetty and an overflying Hobby. Could only get 6 of the 11 Black-tailed Godwits in pic and they were fairly distant. • Thursday 21st August 2014. Michael Nott - Viewed from hide 3:30 to 5:00 p.m.: 11 Black Tailed Godwit (half to left of hide, half to right - couldn't find all of Roy's 13! ); 3 Common Sandpipers: 2 juv Shelducks; 1 Chinese Water Deer. Also some good views of Lapwings (stunning when seen close up) and a nice shot of a Grey Heron reflected in water. The Dunlin, when irst seen from the Car Park bank was resting and looked weary. It perked up and started feeding after 15 mins. Two buzzards and two kites squabbling high above to right of hide. One hobby seen - eventually. Most photos taken from some considerable distance and heavily cropped! Roy Hargreaves - This morning was crisp, fairly calm and sunny and had an autumnal feel to it. My first interesting sighting was a Reeves’ Muntjac trotting across a bare field and a Fox also in the same field but at the other end. From the jetty two Green Sandpipers and the Greenshank were on the mud by the reeds and I could see three Black-tailed Godwits on the mud to the left of the hide. I walked round to the siphon and from there I scanned and could see seven Black-tailed Godwits and immediately wondered if that included the three I had seen from the jetty. David joined me and we walked along to try and see the other side of the ridge and we found four not three Black-tailed Godwits so we were up to eleven. This was a good total until six flew round from the other side and joined the seven so now we had thirteen, all juveniles, scattered around the mud. I also saw a Northern Wheatear drop from the top down to the edge but we couldn’t see it again and I saw it again as I walked to the hide and it was fairly co-operative as the photo testifies. Also about were six+ Common Sandpipers, a Snipe, two juvenile Shelduck and at least one Mandarin. It is also worth noting that the hedges have good number of Reed Warblers in them that are obviously passage birds. Surely a Ruff will appear soon as the habitat is clearly suitable for waders! P.S. 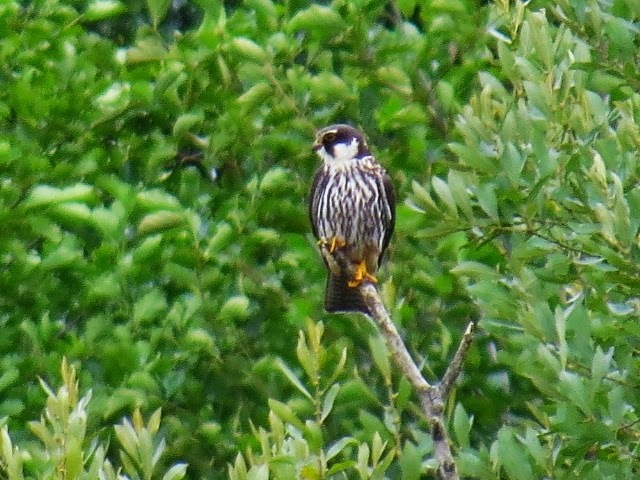 there was also a 1st summer Female Peregrine round the back perched in a tree off by Drayton Beauchamp. It is presumably the birds that I saw recently over Wilstone. • Wednesday 20th August 2014. 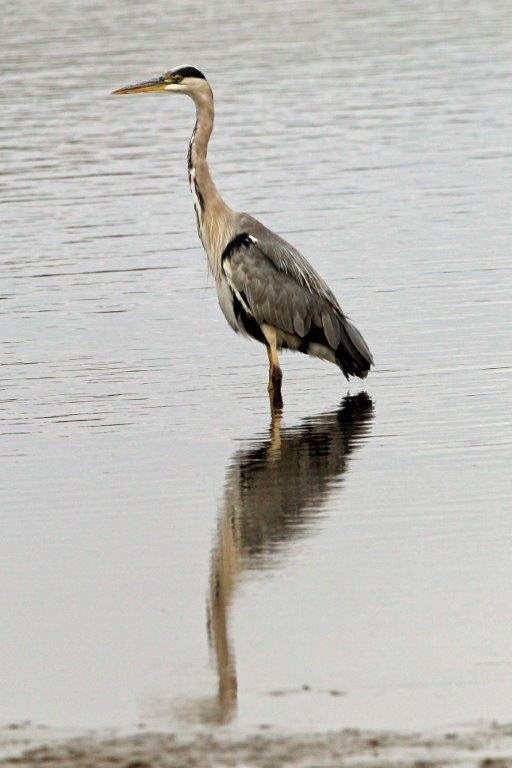 Phill Luckhurst - I returned to Wilstone late this evening and things seemed slow from the hide. 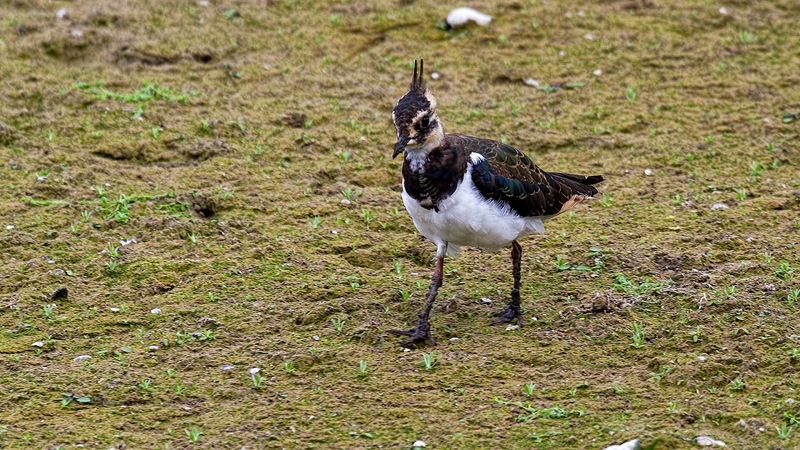 A Chinese Water Deer popped out briefly and we had a nice close visit from a Lapwing. A Wren also made a mistake and came right into the hide perching on the leaves by the door. Walking back to the car I stopped by the outflow as there was a lot of calling. This was from at least 17 Black Tailed Godwits flying around some of the little muddy islands looking for a nice place to land. Up high I think there were a few more. I've never seen this many at Wilstone before. on car park bank (where have they been this year?) Other wildlife out in the open - Chinese Water Deer on three separate occasions, Twice to right of hide spending some tide on mud/grazing. Once to left. Muntjac deer appeared to right of hide where reeds meet tree line. 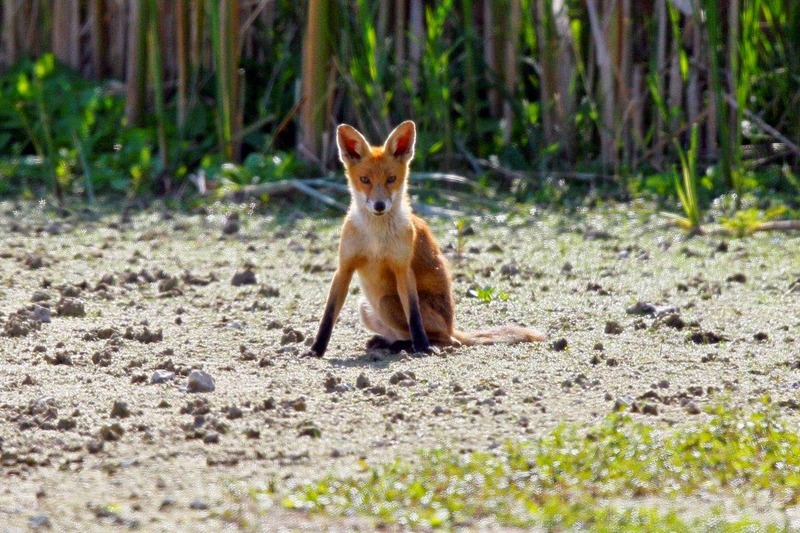 A very emaciated fox made an appearance - very thin and scraggy with a virtually hairless tail. Not long for this mortal coil I fear. • Tuesday 19th August 2014. Phill Luckhurst - I started at Tringford today making the walk along the Wendover Arm, around Wilstone and back again. I normally walk this route armed with my macro kit to shoot bees but it seems this year numbers are really low, hopefully the late flowers will see bigger numbers. Tringford had 13 Little Grebe today, more than I have seen in a while. Along the dry canal I scared off a Woodcock in the undergrowth by the Whitehouses restoration works. 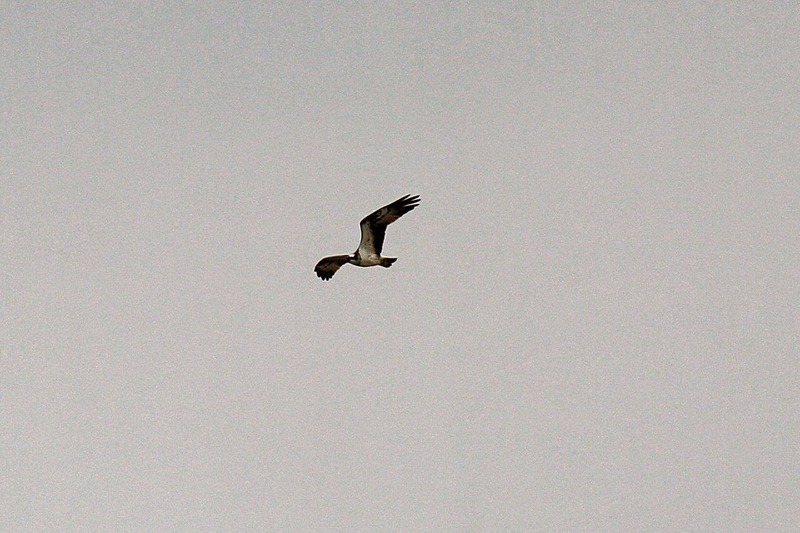 Above a Buzzard was calling and circling throughout my walk. 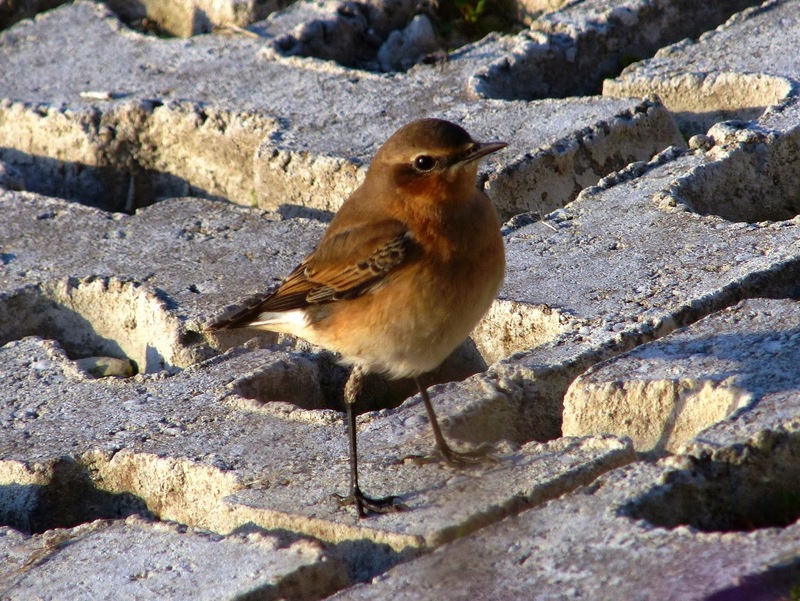 I also saw what I think was a Wheatear but it was a bit too distant to be sure. Wilstone there is not much more to report than Roy has already mentioned. A Hobby made a brief appearance but as dragonfly numbers are rising I hope more come to feed soon. Roy Hargreaves - When I first arrived a large flock of Canada Geese was on the water and the Barnacle Goose was among them. Also an eclipse male Red-crested Pochard has presumably moved from Tringford and was near the spit that is reach out towards the jetty. A Mandarin was among the duck to the left of the hide. There had been some movement of waders since yesterday morning with four Black-tailed Godwits about – two juveniles on the left of the hide and a moulting adult and juvenile on the right. The Greenshank, 3 Green Sandpipers and 5+ Common Sandpipers and one or two Dunlin were still about. Again a female and two young foxes were mobile by the reeds and four Chinese Water Deer were in the meadow by the overflow. • Sunday 17th August 2014. Roy Hargreaves - I watched the Barnacle Goose fly from the previously mentioned field toward College Lake at about 8:25 this morning. The new birds at the reservoirs this morning were four Ringed Plovers that were on a small island but didn’t linger. Having had my best views ever of a Sanderling at the reservoirs earlier this month today I had my worst views as one flew through heading out to the west. • Saturday 16th August 2014. Roy Hargreaves - This morning was much better weather than yesterday but still surprisingly productive. From the jetty two Green Sandpipers were by the reeds and two Common Sandpipers, with two in the corner by the old overflow. From the hide the two Shelduck, Greenshank, Black-tailed Godwit and two Dunlin were still about. While in the hide two Ringed Plover flew in calling and settled on the mud for a few minutes before flying off and then a flock of seven Dunlin flew in and settled briefly in a few places before flying off. Little Egrets were everywhere and a couple of juveniles were about but looked too neat to be the local birds and the nest was still occupied by something but again obscured. Two eclipse male Mandarins were also about. Startops had the Barnacle Goose and it was quite obliging being on the right side of the reservoir for the light as it sat among the Greylags before flying on to the paddock. Marsworth had the usual eclipse male Mandarin on the bank. • Friday 15th August 2014. 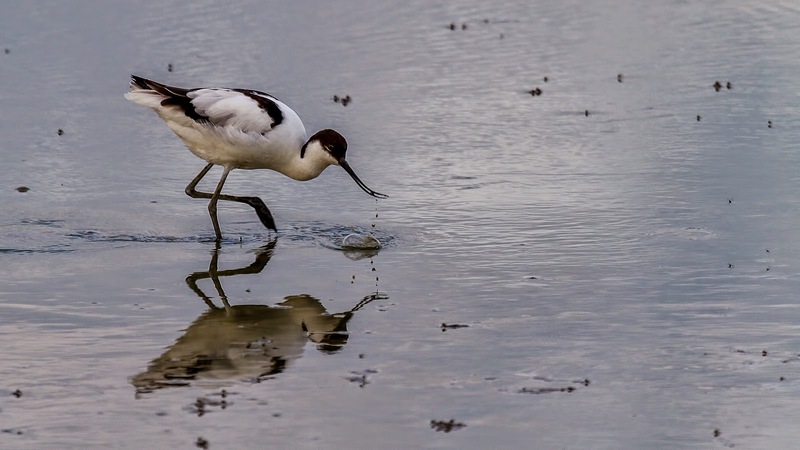 Roy Hargreaves - North-westerly winds can be good for pushing waders towards the Chilterns and with dull weather at this time of year it can be very good. This morning as I walked down it rained fairly heavily so I headed for the hide, seeing a female Chinese Water Deer on the way. From the hide the 2 juvenile Shelduck, the Black-tailed Godwit, the Greenshank and a Dunlin were visible. Walking round to the car park steps I stopped and could see two of the Little Egret chicks perched above the nest and clumsily dropping back into it and there was a white blob in the nest but whether that was one or two chicks or an adult was impossible to say. Also from the overflow two Chinese Water Deer fawns were in the meadow. At the overflow I joined Steve Rodwell and we discussed the lack of dynamism in the waders. Scanning Steve noted a second Dunlin with the first by the hide. I thought I heard a Dunlin and Steve spotted a flock of eight Dunlin that flew round before heading off north. A Little later we heard Dunlin again and I spotted one flying round which ended up near the other two by the hide. We also had a Raven fly over heading towards Wilstone village. Continuing to the jetty I scanned from there and I could see 3 Green Sandpipers, 4 Common Sandpipers and a Water Rail along the edge of the reeds. • Thursday 14th August 2014. 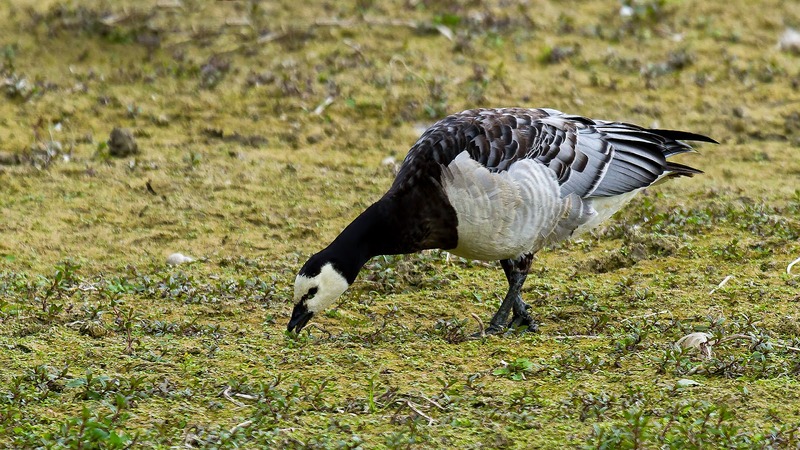 Roy Hargreaves - This morning I decided to cover all of the reservoirs to try and get a better look at the Barnacle Goose and see what else is around. From the Jetty the Barnacle Goose was with the Canada Geese at first before flying off by itself. Also from there three Green Sandpipers, two Common Sandpipers and a Dunlin were visible and a Little Egret flew into the nest. By the hide the Black-tailed Godwit, Greenshank and two Shelduck were about as was a juvenile Water Rail and this Green Sandpiper, which seems to me to have a longer bill than normal. 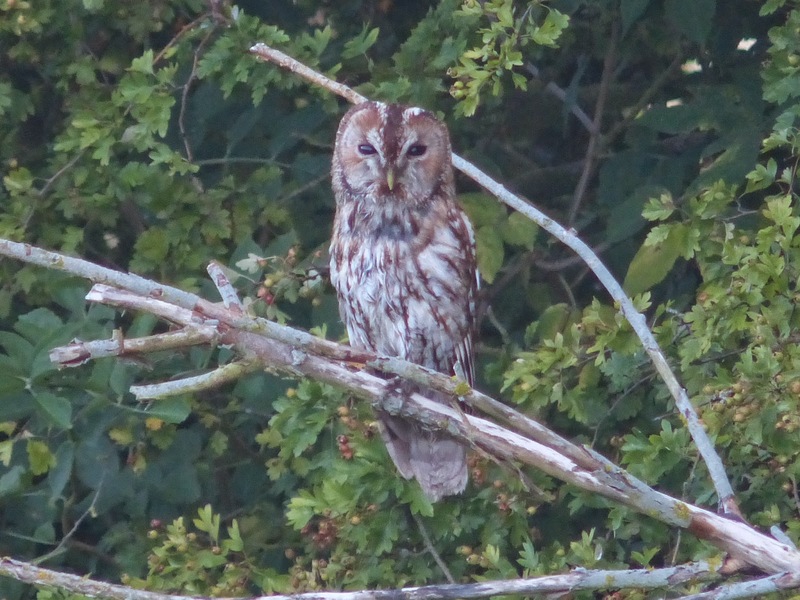 I also heard a Tawny Owl in the copse by the footpath down to the Farmshop. 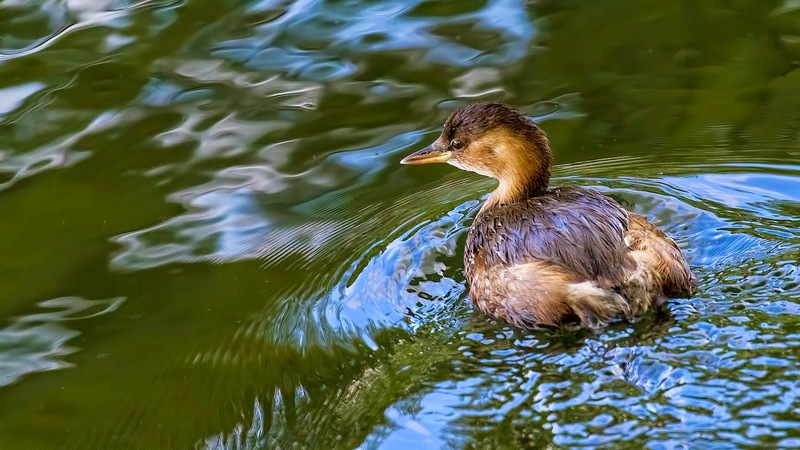 On the smaller reservoirs Tringford had three Red-crested Pochards and four Little Grebe chicks. 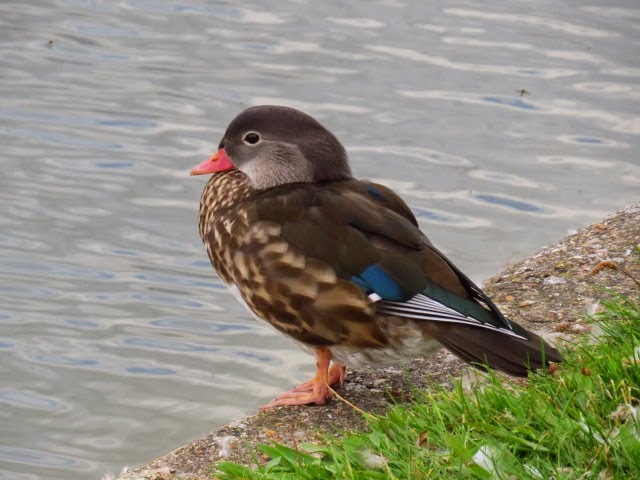 Marsworth had the eclipse male Mandarin on the bank of the causeway. 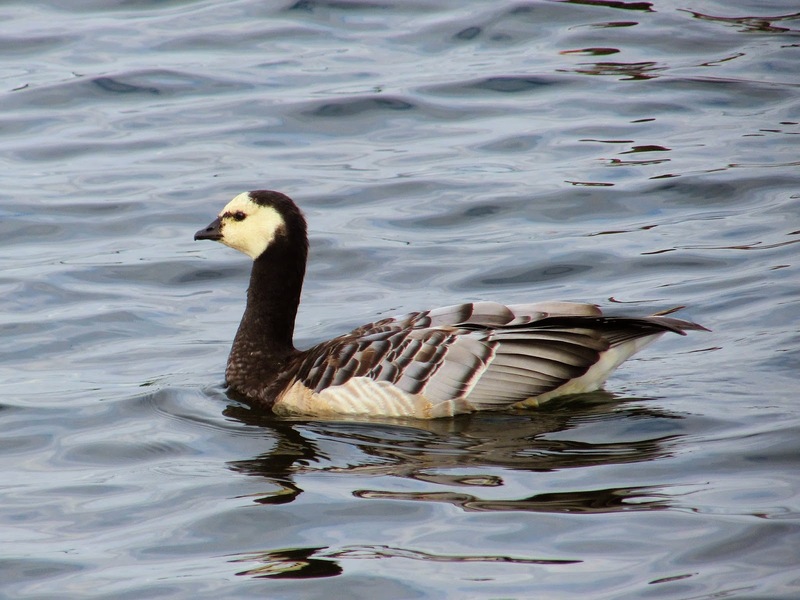 The Barnacle Goose was in the paddock visible from by the Marsworth emergency overflow with a small group of Greylags. • Wednesday 13th August 2014. 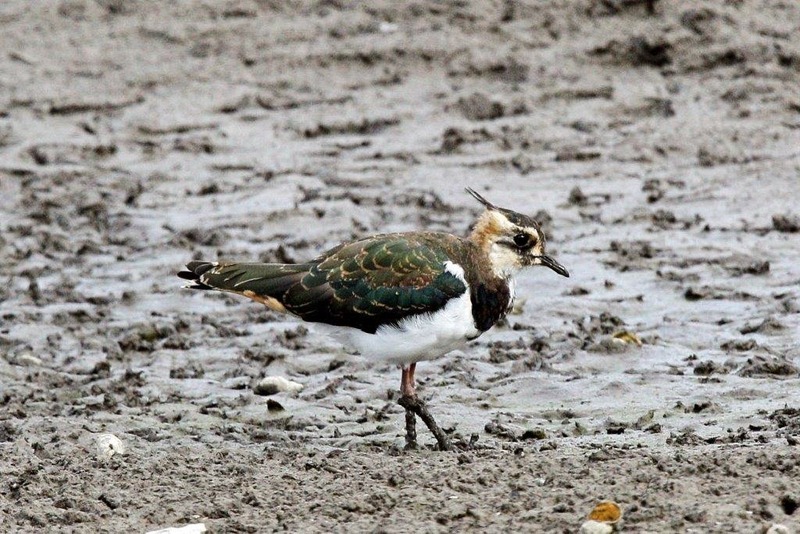 Dave Hutchinson - Wilstone is looking very good for waders. This afternoon there was Greenshank, BT Godwit, 2 x Green Sandpiper, 1 Common Sand and good numbers of Lapwing. 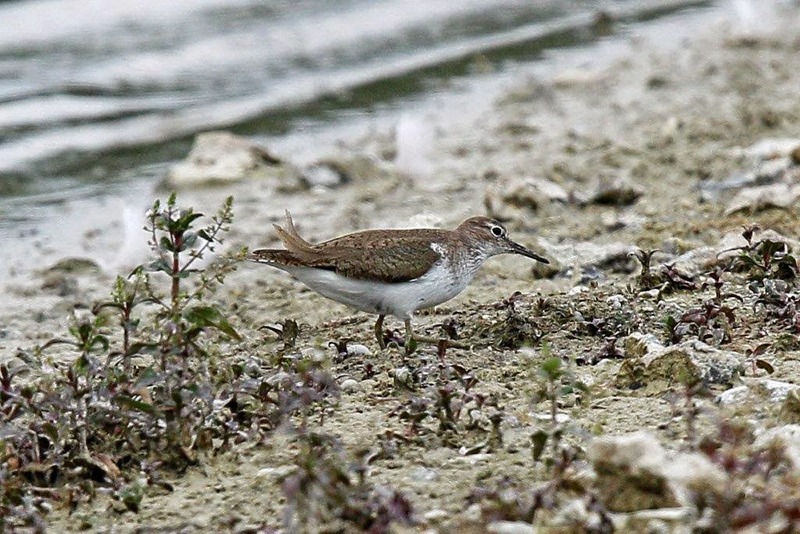 Roy Hargreaves - This morning three Green Sandpipers were together walking along in front of the reed bed roughly where the Spotted Crake was last year. Several Common Sandpipers were scattered about and mobile. A juvenile Dunlin was on the central bank by the sluice. The Little Ringed Plover was in the corner and try as I might all I can see is a small patch of white where the Little Egret nest is. By the hide the juvenile Black-tailed Godwit and juvenile Greenshank were active and a juvenile Shelduck was also still about. One of the fields round the back had three Buzzards looking for carrion as it has been cut the previous day and two Red Kites were floating around too. Apparently the Barnacle Goose was on Marsworth this evening so it is definitely lingering. 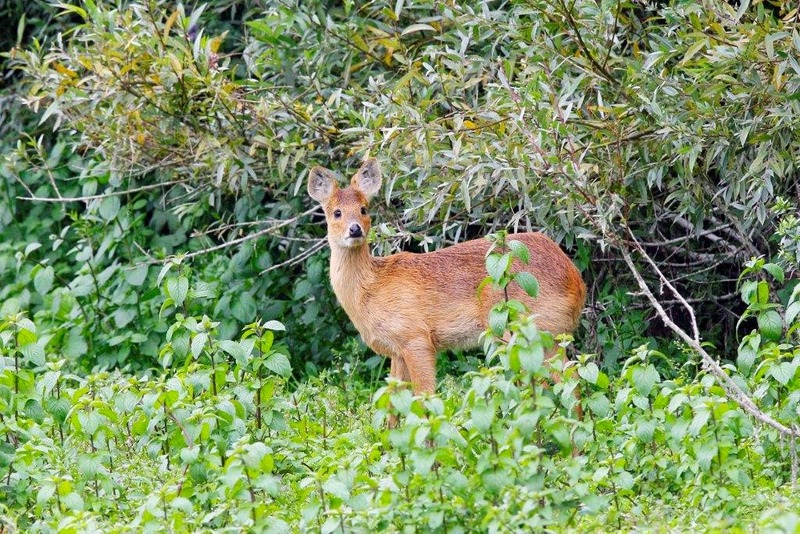 On the mammal front there was a Chinese Water Deer fawn in Rushy Meadow and three fawns and a female Chinese Water Deer in the meadow by the overflow. • Tuesday 12th August 2014. Phill Luckhurst - Wilstone today had little change to Roy's report from yesterday apart from the arrival of a Barnacle Goose mixed in with the Graylag flock. A pair of Hobby were occasionally showing and teasing us by flying directly over the hide. From the Plover hide 2 Kingfishers were feeding, there were 3 very young Moorhen chicks being hunted by a Hereon right in front of the hide. 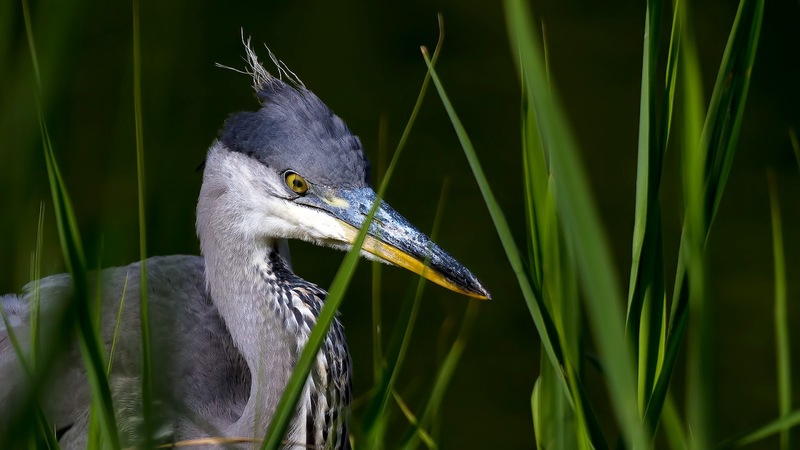 I have included a pic of the Heron as it shows nicely its third eyelid whipping across its eye. Just before I left a pair of Bulfinch arrived feeding in the bushes to the left. Roy Hargreaves - This morning one Green Sandpiper on the Cemetery Corner mud and a moulting adult Black-tailed Godwit was straight out from the hide and there was a juvenile Black-tailed Godwit on the mud by the hide this evening. The Greenshank and two juvenile Shelduck were still present as was the Little Ringed Plover. 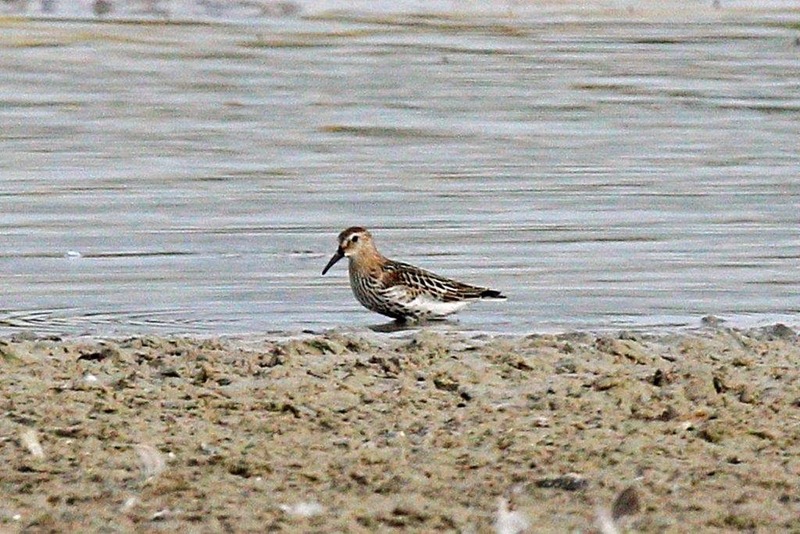 Three Green Sandpipers were on the central bank and also three Common Sandpipers. 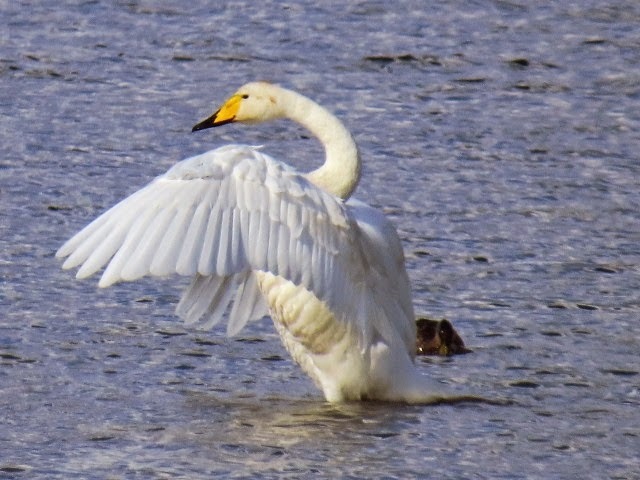 Two Whoopers was stood in shallow water by the mud today. There is a wing of a Little Egret in the meadow behind the hide so obviously one has been predated recently. Steve saw the Barnacle Goose with Canadas this evening at Wilstone and then I saw it at dusk flying off from Startops with Greylags and landing in a field towards Long Marston and just south of the canal. • Monday 11th August 2014. Roy Hargreaves - This morning was breezy but at least it was dry. Cemetery Corner had two Green Sandpipers and two Common Sandpipers were on the central bank. While I was viewing a Dunlin on the central bank a Common Snipe flew over me. The Little Ringed Plover and Greenshank were on the mud by the old overflow and two Green Sandpipers and a Common Sandpiper were by the hide. 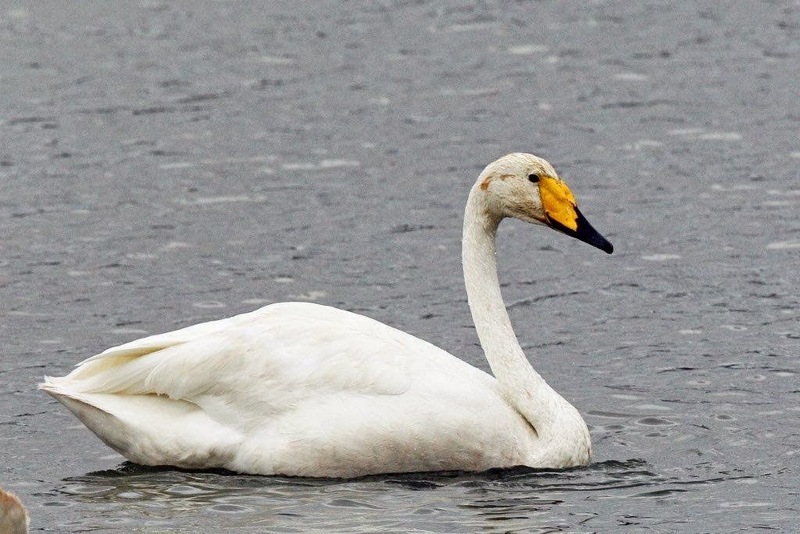 At least two juvenile Shelduck were still about and one of the Whooper Swans, that wander about from Wardown Park in Luton, was swimming about calling loudly. • Sunday 10th August 2014. Sally & David Douglas. Wilstone 1600. Very distant photo's of a Black-tailed Godwit in the area right of the hide spit but taken across the water from near the new overflow! Dodging the heavy showers unfortunately made it impossible to walk round to the hide where good views would have been possible. Also a Dunlin fraternising with the Little-ringed Plover on the exposed mud near the overflow. Phill Luckhurst - Wilstone today seemed to have lots of waders today. In the usual corner by the old overflow was the Little Ringed Plover but today it was joined by a Dunlin. To the right of the hide as 2 Heron did battle 5 Snipe were flushed from the reeds. There were Common and Green Sandpiper feeding along the little stream and to the left of the hide were 2 Redshank along with the Juvenile Greenshank. While watching these there were a couple of panicked take offs first when a Buzzard flew over then just as everything became settled again a Peregrine shot through but quickly gave up its attack when mobbed by various gulls. What it did send up but I did not see it return was a Black Tailed Godwit that I had not noticed in amongst the Lapwing. Walking back I was surrounded by hundreds of Martins all feeding on insects blown up by the winds. Sat on the string of bales it was great to see a Black Tern albeit at a big distance. Johne Taylor - Violet Hellerborines now flowering in Bishops’ wood, Tring Park. 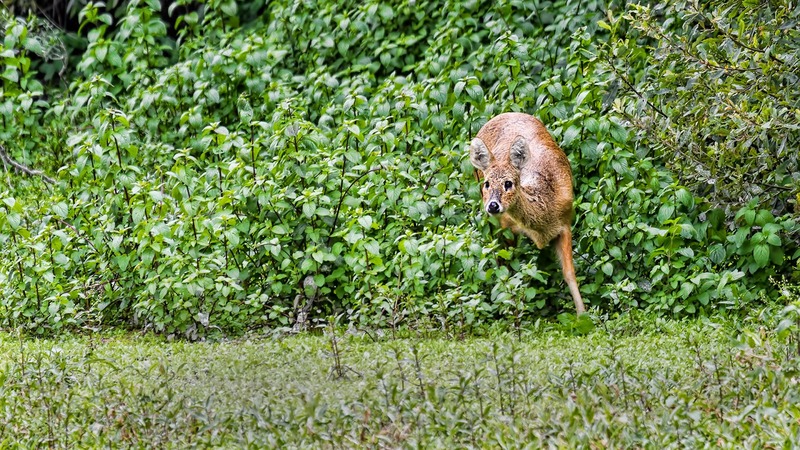 Roy Hargreaves -This morning in a brief visit to Wilstone I saw a family party of five Chinese Water Deer in the meadow by the new overflow – Ian told me about four in there yesterday so maybe they will stick there for a few days. The four juvenile Shelduck were still about as was the Greenshank and Little Ringed Plover. Yesterday I saw a (the) juvenile Mediterranean Gull in the paddocks with a flock of Black-headed Gulls. • Friday 8th August 2014. Sally & David Douglas - Friday 8 August Startops. 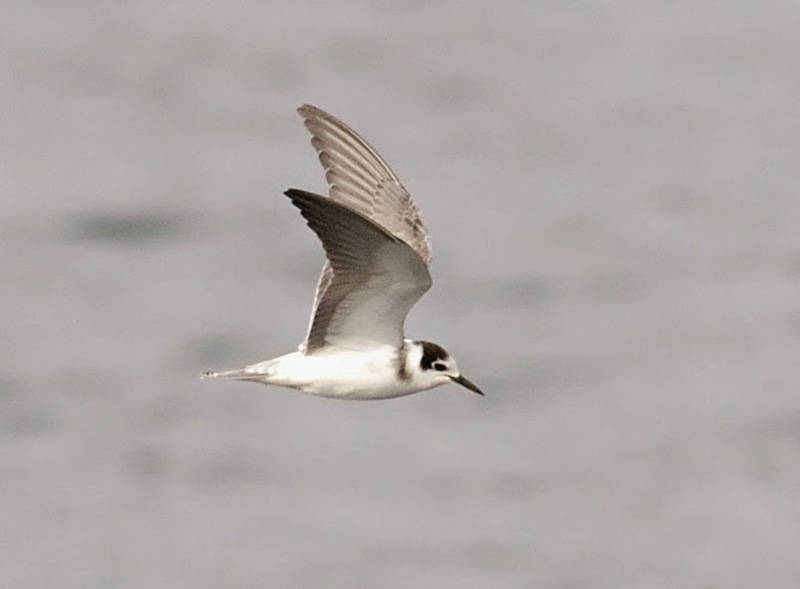 Some rather distant photo's of the moulting adult Black Tern. At Wilstone the L Ringed Plover, Com Sandpiper, Greenshank and Redshank. Roy Hargreaves - A quick update. 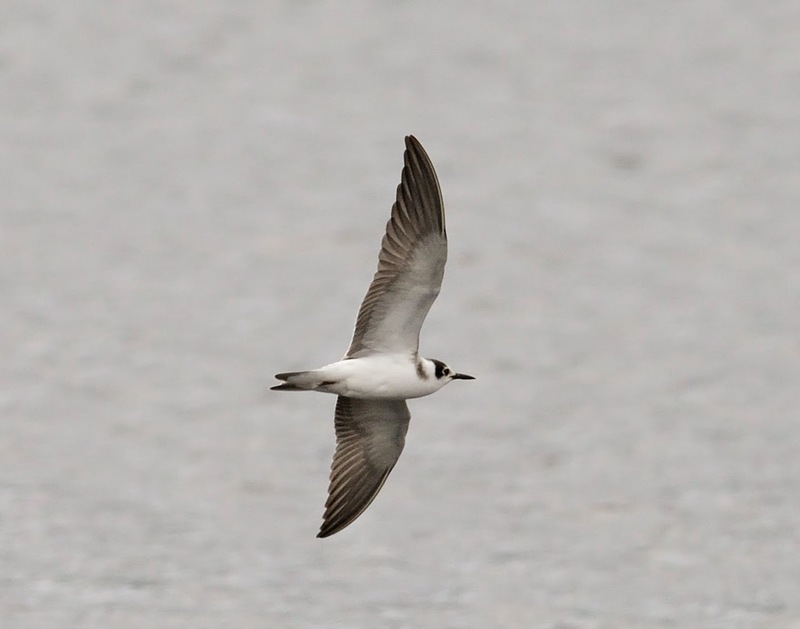 There is a moulting adult Black Tern at Startops this afternoon – still present 2:45 at least. 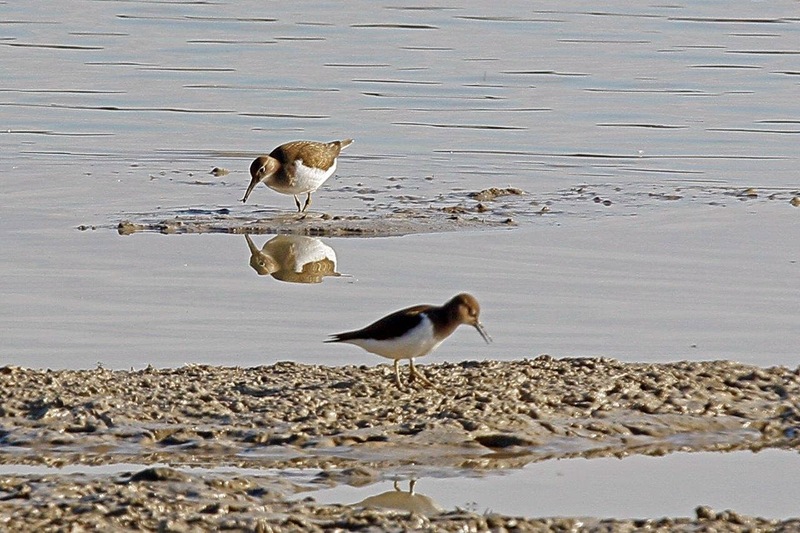 Roy Hargreaves - This morning two Green Sandpipers were on the mud in the Cemetery Corner, two or three Common Sandpipers were about, a Little Ringed Plover was on the edge between the car park steps and the overflow. The four juvenile Shelduck were still about and a juvenile Greenshank, which had flown round earlier was down to the left of the hide when I got there. Before that David Bilcock had got to scanning the gulls before I did and he picked out a juvenile Mediterranean Gull among the Black-headed Gulls which flew off before I got to the overflow and so eluded my camera. • Thursday 7th August 2014. 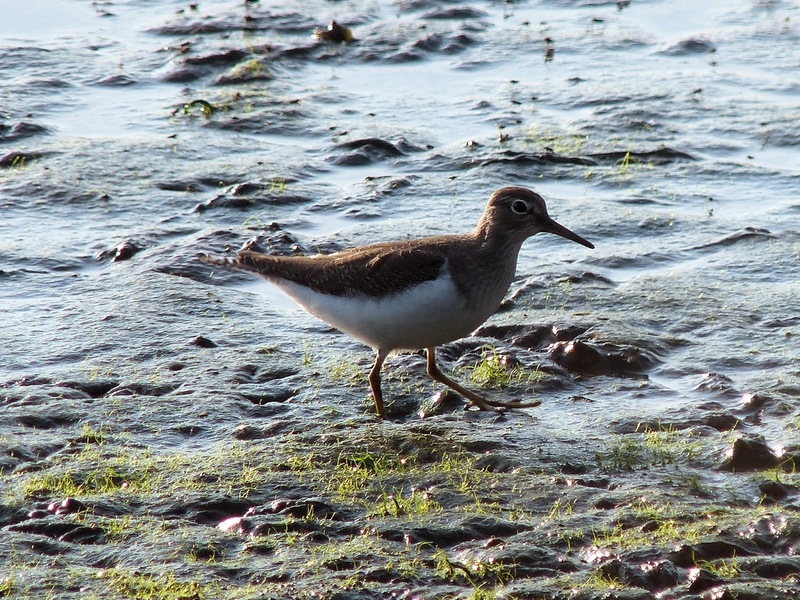 Roy Hargreaves - This morning I again started with Green Sandpiper on the mud by Cemetery Corner and from the jetty I could see a Common Sandpiper in the middle and the four juvenile Shelduck by the hide in the distance. Walking towards the north corner I saw this brown blob on a branch and was most surprised to see a Tawny Owl. It was more surprising when it stuck around long enough for me to sort my camera on to a high enough ISO setting and rattle off several photos. It then disappeared into the small wood by the steps down to Meads farm shop and cause the birds in there to go into a state of alarm. As usual David and I stood looking for flyover waders and heard a Redshank and I remarked that the last time that had happened a Black-tailed Godwit and Greenshank had appeared a little later. Sure enough about five minutes later we heard and eventually saw a Greenshank flying round and it eventually settled on a barley bale. 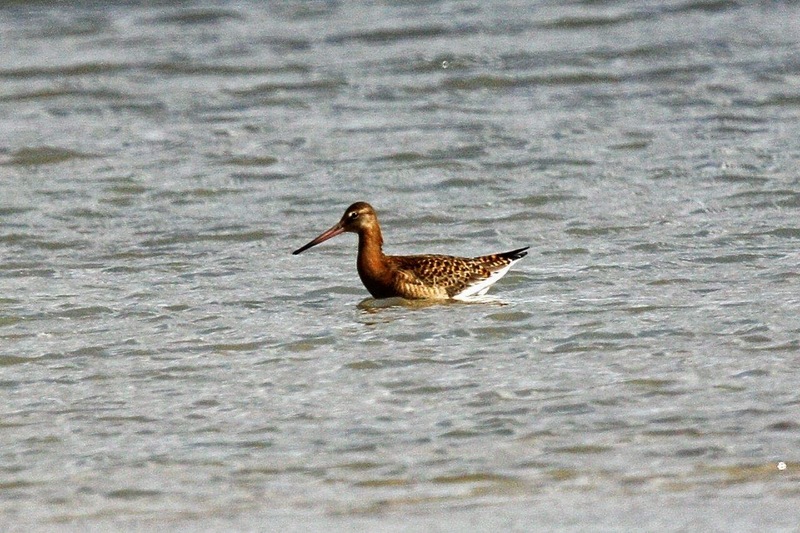 No doubt the Black-tailed Godwit will turn up later as they did yesterday. From the hide a Snipe and another Green Sandpiper could be seen as could the Shelduck, although the light was terrible so here is a photo from yesterday when it was dull. • Wednesday 6th August 2014. Roy Hargreaves - This morning’s highlight from my perspective was a Peregrine. 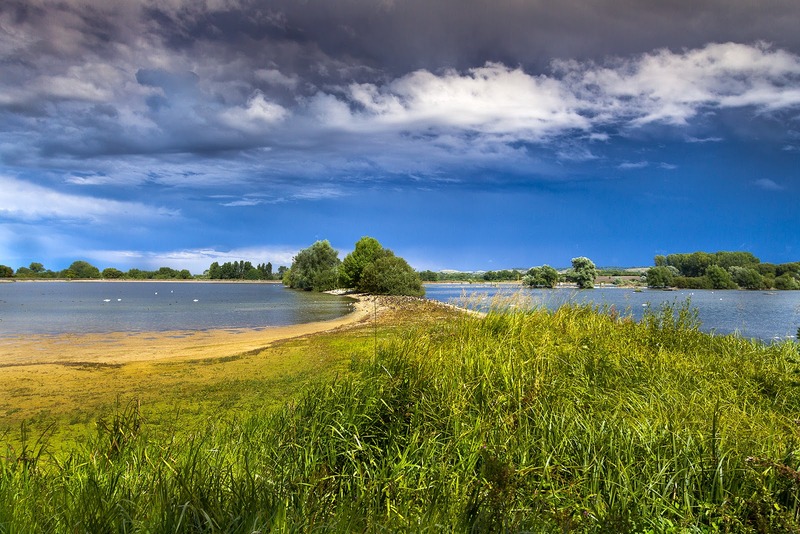 When I arrived at Wilstone the spit was empty and the Lapwing, Black-headed Gulls and Common Terns were all in the air. I wondered if a Fox had walked along the spit but when I heard the terns kicking up a fuss the reason for the panic became apparent as a juvenile female Peregrine was the centre of their attention and wandered off being pursued by one tenacious Common Tern. Otherwise there were two Green Sandpipers and 2 or more Common Sandpipers about and the lone Little Ringed Plover was also on the mud towards the old overflow. The four juvenile Shelduck were also back and reasonably close to the hide. 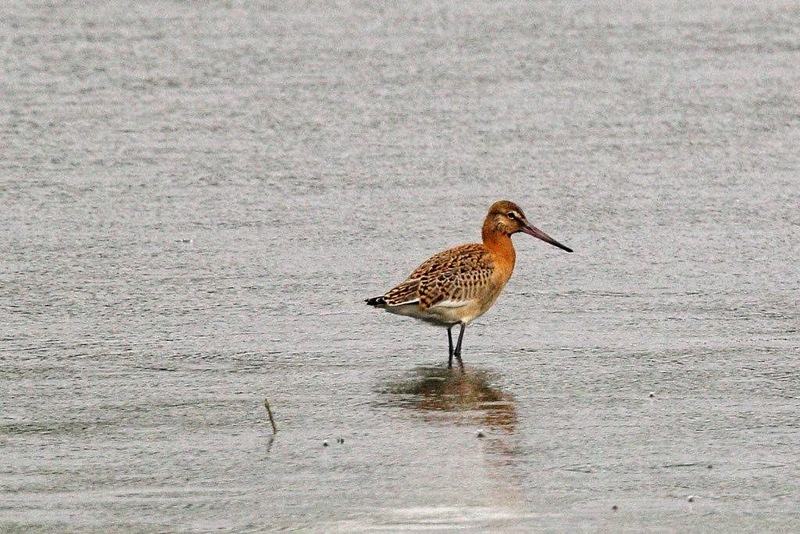 Steve Rodwell reported three Black-tailed Godwits later in the morning at Wilstone. 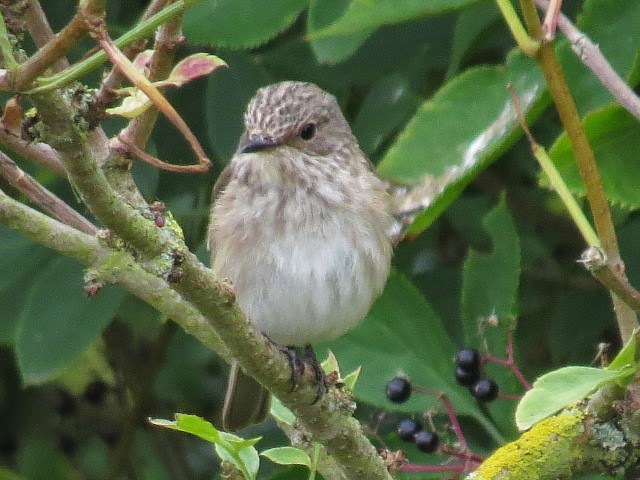 In Startops Wood the family of Spotted Flycatchers were vociferous and active when Rob and I walked back to our cars. • Tuesday 5th August 2014. Roy Hargreaves - Theoretically it was meant to be cold this morning, but clearly the weather hadn’t been told that. There was a thin layer of mist in the vale but this failed to reach Wilstone Reservoir. 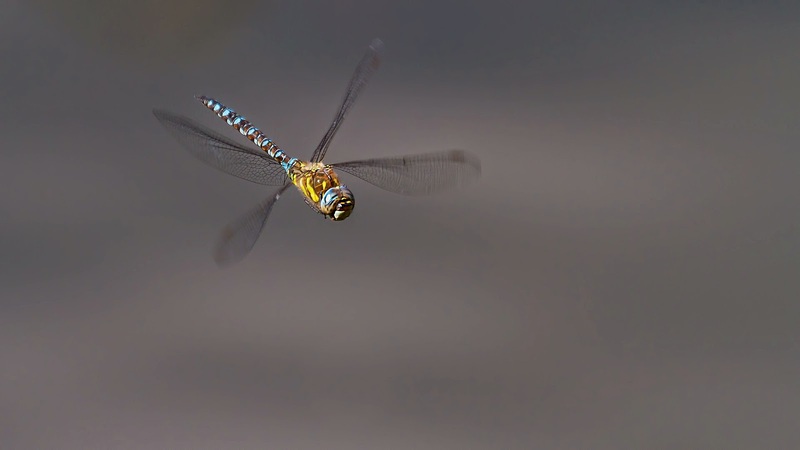 Before reaching the reservoir I saw my first Migrant Hawker of the year this morning flying along the hedge by the Dry Canal. 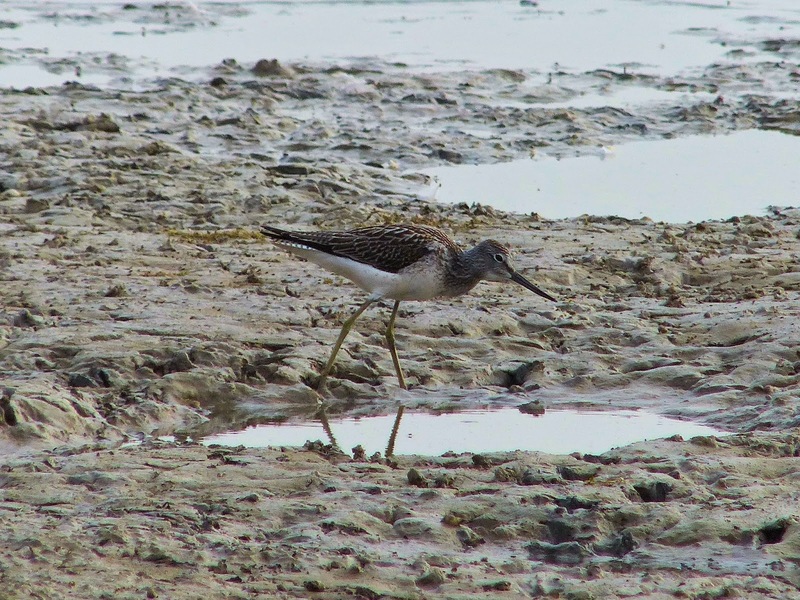 A Green Sandpiper was in the now usual spot on the mud by the east corner. 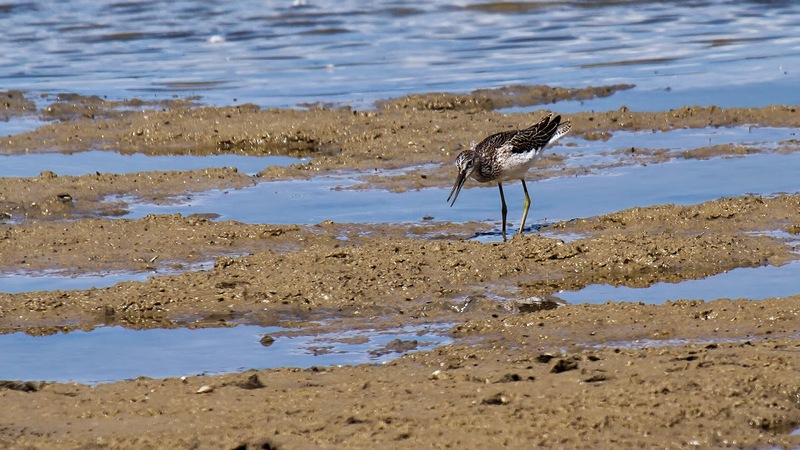 I approached the jetty with my usual caution as Common Sandpipers often by the depth gauge. 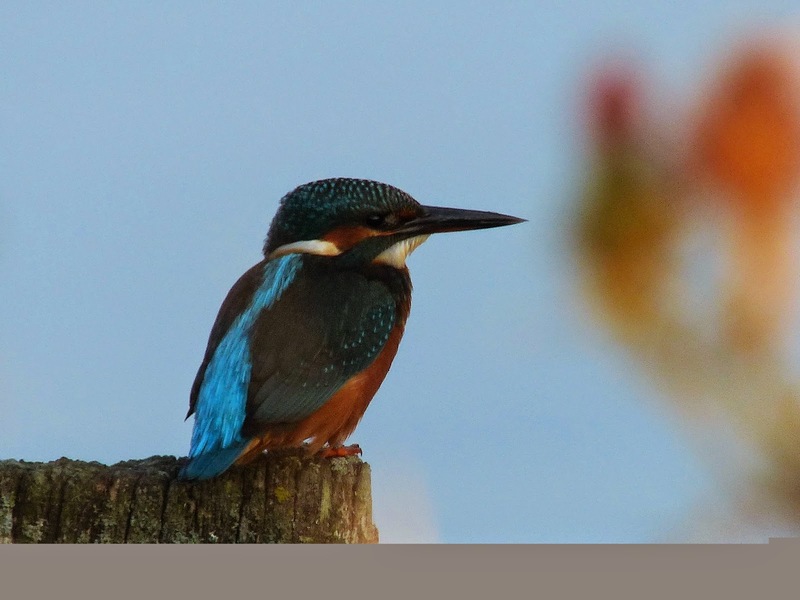 This morning I was surprised to see a Kingfisher on top of it and even more surprised when it didn’t fly off. While standing with David Bilcock watching for flyover birds four juvenile Shelduck flew in and settled by the hide. Predictably they flew off into Bucks before I set off to the hide. Two or three Common Sandpipers were mobile about the reservoir and the one I photographed was on the wrong side of the hide for the light but still not bad. The two Mandarin were in the creek by the hide. 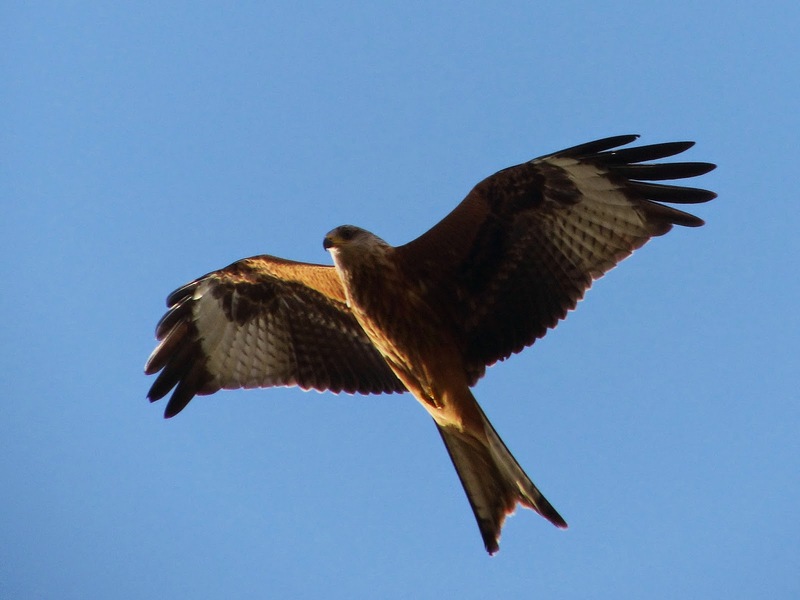 Walking back towards home I had a pristine Red Kite circle overhead to make a change from the mostly scruffy birds that I’ve been seeing recently. • Monday 4th August 2014. 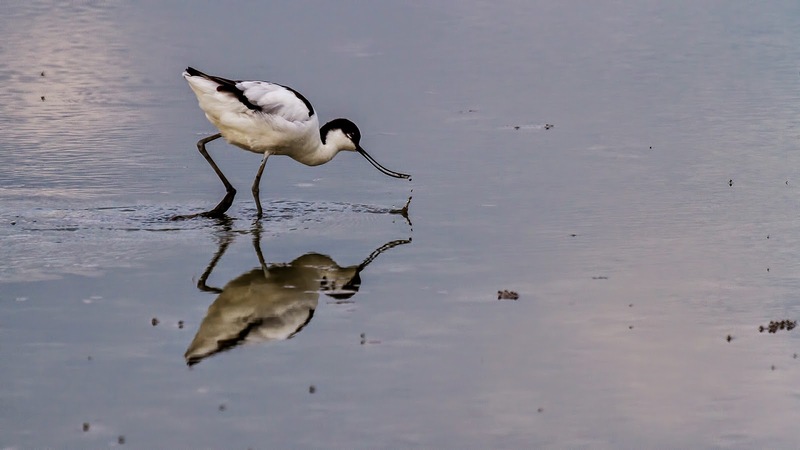 Michael Nott - Wandered round to the hide with Dave Hutchinson. Spit is very exposed and had lots of lapwings and Geese on it. About 20 metres of mud to left of hide. Lot of birds on the water. 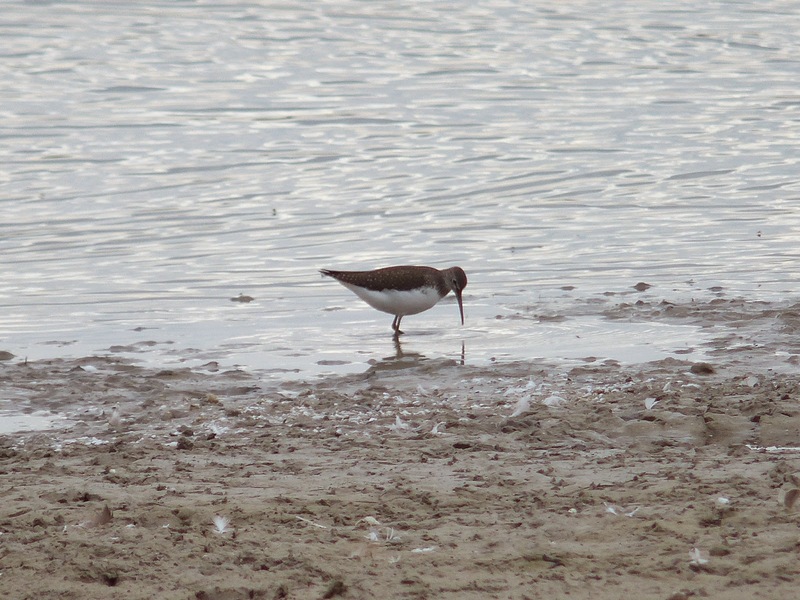 Dave spotted the attached Common Sandpiper on one of the tern rafts which it moved to the left had side of the spit. 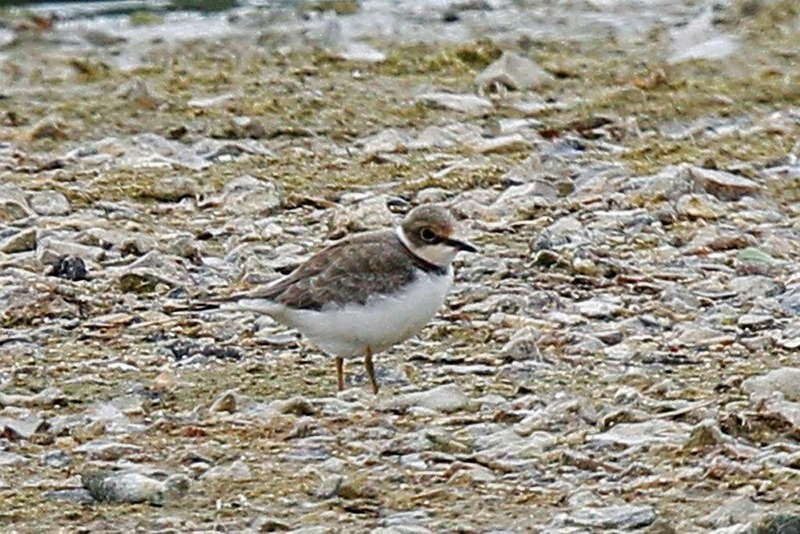 Juv LRP also on mud near Drayton Beauchamp corner on way to hide. Shot is heavily cropped. Good to see movement! • Sunday 3rd August 2014. • Saturday 2nd August 2014. Phill Luckhurst - An interesting morning with the first surprise being a Turtle Dove sat on the roof of the cemetery entrance. 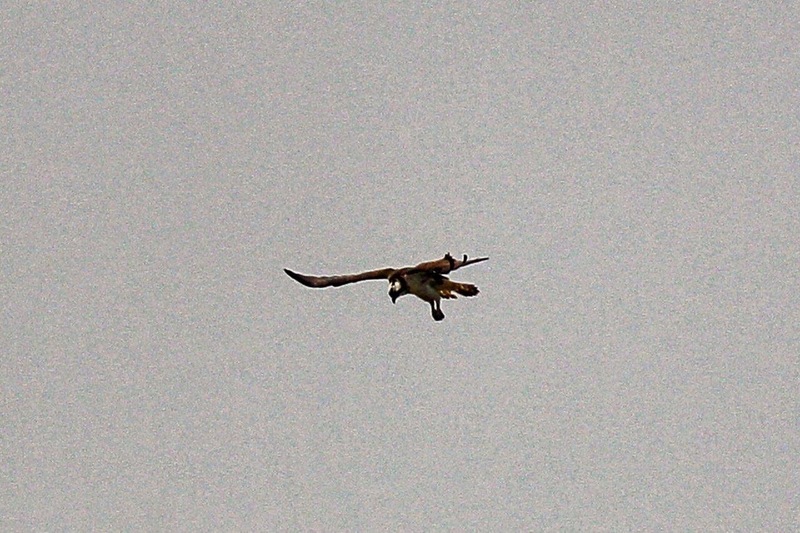 By the time I had parked and got the camera out it flew off towards the trees in the corner of Wilstone. 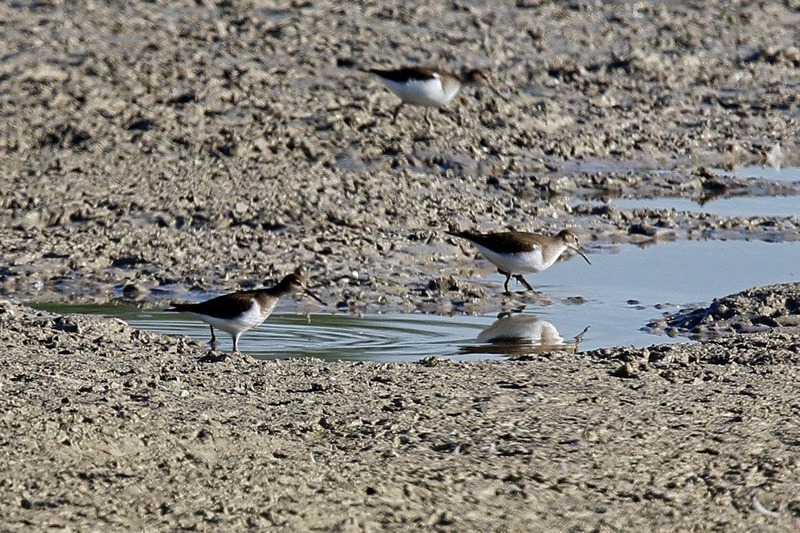 I also found 3 Green Sandpipers in the same corner. 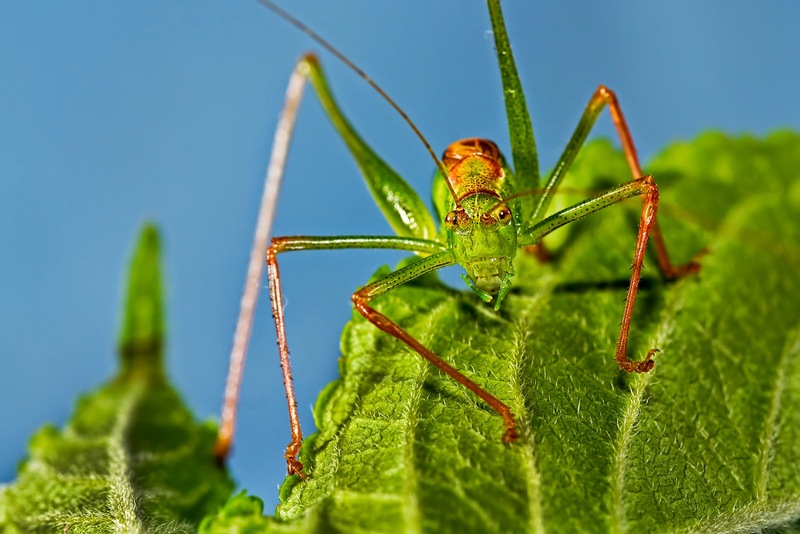 I then decided to get the macro gear out to photograph a very accommodating Speckled Bush Cricket. Roy Hargreaves - At Wilstone this morning there was a juvenile Little Ringed Plover on the narrow mud fringe by the overflow, 2 Green Sandpipers on the mud by the east corner, 3+ Common Sandpipers scattered about, an eclipse male Mandarin by the hide and one immature Water Rail along the edge to the right of the hide. 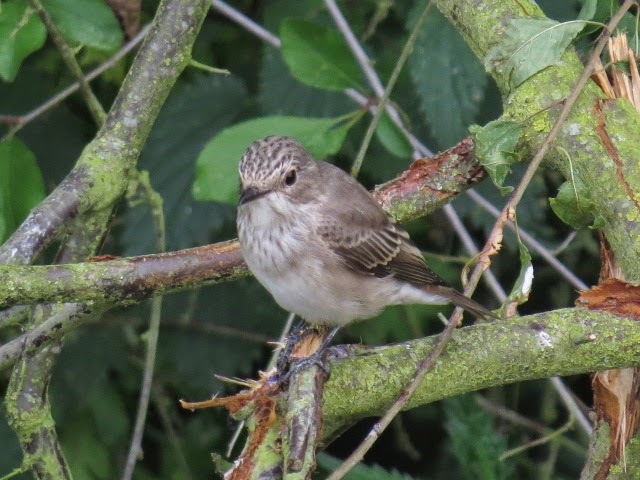 The causeway between Marsworth and Startop’s End had at least one Spotted Flycatcher calling in the trees. • Friday 1st August 2014. 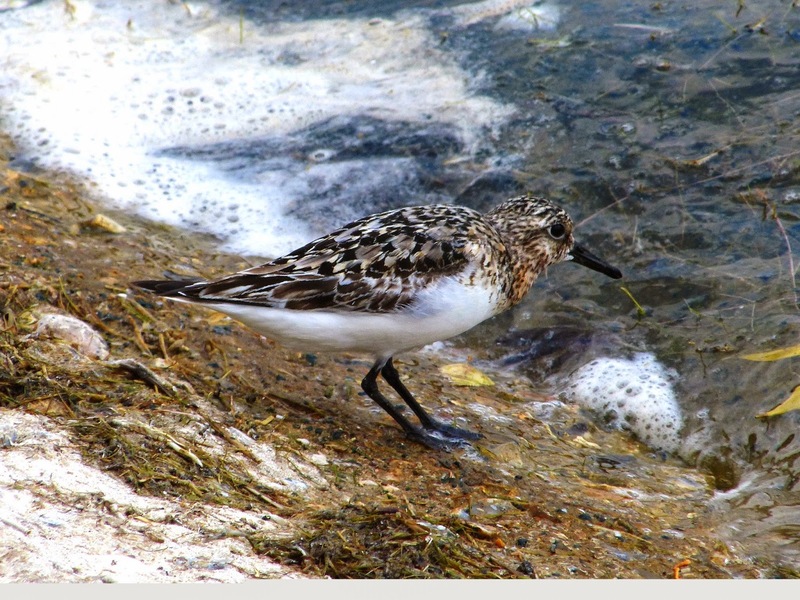 A Sanderling was reported this morning in the North corner of Wilstone, found by Steve Rodwell and photographed by Roy Hargreaves. Reported to have flown off early afternoon. Thanks also to Ben, Dave and others who got the word out quickly.